How to deliver the car from England? Before you choose a way of delivery of the car, carefully weigh all "for" and "against". Depending on the class, the value of your car, volume of the engine, and some other parameters, you need one or another way. 1. Delivery by the road. Suitable for cars in a good technical condition. Remember, the more the volume of the engine - the more expensive will be the cost of such delivery. 1 liter of 95 gasoline is now in Europe about 2 euros - in the area of 80 rubles! The route of the trip can be absolutely any, but I advise you to refrain from mountain (South) regions of Europe and to adhere to the line of the Baltic sea. The first task on Your way to travel across La Manche. The easiest way to do this under the ground on the train. Special compounds with 2-storey cars-by road train running every hour. 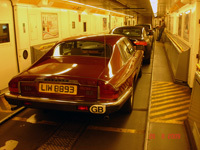 You need to book a flight on the web site www.eurotunnel.com and come for an hour and a half in the terminal near the town of Dover. The cheapest way to go at night, and if you book a ticket in advance, it will cost in the region of 50 pounds. For particularly economical: if you book the ticket in both directions (England, France, and France and England) in the end can come out cheaper than buying a single ticket (nobody would be upset, if You will end up not going back :)! 45 minutes under the earth, and you are in France! Then I usually meal on a route: Calais (France) - Antwerpen (Belgium) - Dortmund (Germany), Hannover (Germany), Poznan (Poland) - Warzawa (Poland). Further either to the North - in Lithuania and Latvia - in Saint-Petersburg, or South through Krakow (Poland) in Ukraine and beyond. But this second route I do not advise you to use the roads in Western Ukraine is not in the best condition, even in spite of the recent preparation to "Euro-2012". If you try, you can kill any suspension, and have a chance at all does not reach to the place of destination. The most common and inexpensive option. If the machine is expensive, exclusive, or simply eating a lot of gasoline is better to choose it. For example, the delivery of the car deck of an old Rolls-Royce from Harwich (great Britain) in Turku (Finland) costs about 800 - 900 euros. If the machine is floating in a special container - the price should be multiplied by 2. For comparison, I paid 400 pounds (approximately EUR 600), to bring 130 miles Rolls-Royce on the эвакуаторе in the port in England. With routes directly in Saint-Petersburg or other Russian port do not advise you to communicate, as the level of corruption and various lawlessness in these places just rolls over and receipt of goods can be quite a complicated business. If in the Finnish port You will take a maximum of an hour all the formalities and You pick up the car, then in the port of St. Petersburg if You have it will take less than a week you can believe that You're in luck! In Finland the same floats from England several low-cost European carriers. I use the services of Mannlines. There is also a Finnlines and others. From the Finnish ports almost every hour sent trucks in Russia and deliver the car across the border would not be a complicated task. Usually this is the situation with luxury cars for which employ special truck, carefully and accurately carry on Europe, and most of all in Europe, the machine is left for permanent residence. The owners of these cars though, and speak Russian and are in Moscow, but prefer to live on the Mediterranean coast of France or Spain.